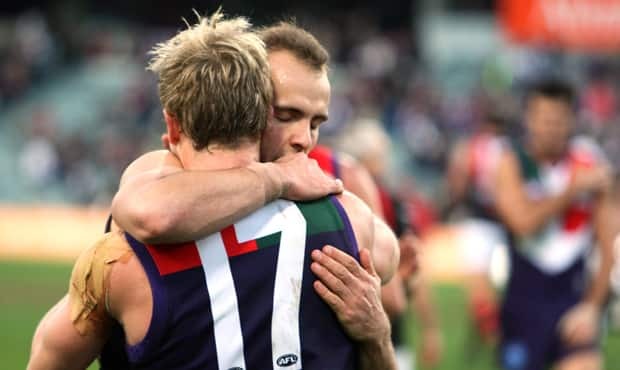 Mark Johnson and premiership teammate Adam Ramanauskas embrace after Johnson's 200th game. A milestone he reached as a Fremantle player against his old side. When you retire it’s not so much the games that you remember, it’s more the fun and just being around the guys and having a good laugh. When Kevin Sheedy and James Hird said goodbye on their final lap of the MCG, Mark Johnson’s future was uncertain. It was the penultimate round of the 2007 season. Johnson had unknowingly played his last game for Essendon. Sheedy and Hird knew their days at the Dons were done and the pair said a final farewell a week later in Perth. Johnson had just played his 194th game for the Club but was out of contract. He wanted to reach the 200 game milestone, but when the Bombers appointed their new Coach, he realised if he was to accomplish that goal, he’d have to do it elsewhere. “To be honest I did hate it, I didn’t want to leave the Essendon Football Club,” Johnson told Bomber Radio. “At that particular time we had Sheeds just leave, so Matthew Knights came in and basically wanted to start afresh and unfortunately I was out of contract. The Bombers couldn’t find a suitable trade, so Johnson entered the uncertainty of the National Draft. The premiership winner trained with North Melbourne in the lead up to the draft, but Fremantle and Coach Mark Harvey – Johnson’s former backline mentor at the Bombers – trumped the Kangaroos to snare him with an earlier pick. “I started training with North and I really liked the way they went about things,” Johnson said. “But then Mark (Harvey) took me with the pick before North were going to take me. “Mark wanted me to go there to show those guys who had very limited success, just work ethic. “I’ve always prided myself on working hard wherever I had to. Johnson did get to 200 games and as fate would have it – he did so against the Bombers. His old side got up by four points. Johnson enjoyed the West Australian lifestyle but 2008 was his one and only season at Fremantle. He retired at the end of the year. Johnson now lives in Melbourne, just a stone’s throw from Windy Hill, and works as a carpenter. He remembers fondly the mateship that was an ever-present theme throughout his days at the Bombers. Johnson said the games were fun, but the friendships mean more. When the Bombers were atop the AFL tree, the post game analysis was done in a pub near Windy Hill over a beer and some fried food. An unshakeable bond was formed. “When you retire it’s not so much the games that you remember, it’s more the fun and just being around the guys and having a good laugh,” Johnson said. “Just fond memories of friends and acquaintances that I’ve met. You appreciate the opportunities that were given to me and what I’ve been able to do since.